This vegan alfredo sauce is made from cashews. And it's so rich and creamy, you'll never believe it's 100% dairy-free. All that - and you can make it in just five minutes! Add the cashews, nutritional yeast, water, mustard, and garlic to the blender. Blend until the mixture is smooth and creamy. Add salt and pepper to taste. 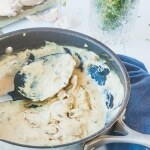 For serving: Heat the vegan alfredo sauce in a large frying pan, over medium heat until warmed through. Toss with your favorite pasta, and enjoy! Don't be scared of the nutritional yeast - it adds a wonderful cheesy flavor to the pasta. Variations - To make a vegan mushroom alfredo sauce (as pictured), simply saute some fresh mushrooms in the frying pan before adding the blended sauce. Mix it all together to heat through and serve. Yum!